After our weekend at the Eco Technology Show, the team are back in the office. We had a great but tiring two days at the show, meeting up with old friends and new. Stuart was an Expert Advisor for the show, giving 20-minute advice sessions to a number of visitors. Queries ranged from options on insulating a flat, to installing a ground source heat pump, to off-grid living. 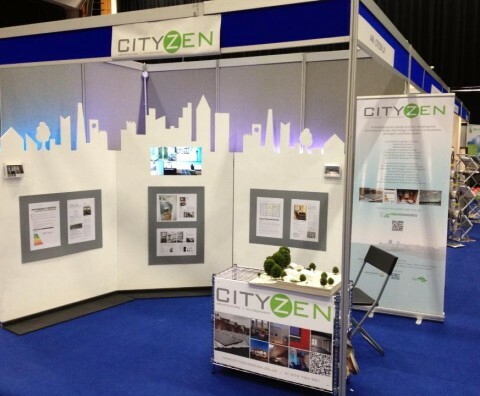 On our own stand, we met with show visitors considering changes to their homes – extensions, layout changes, loft conversions and a new build garden room – to discuss how Cityzen could assist. We really enjoy talking to people about their projects, whether they have a strong plan already in mind or simply know what they don’t like about their existing space so this was a great day out for us. The week doesn’t stop for us here as this weekend we’re at the Hanover Community Centre’s One Planet Living Public Meeting on Saturday, from 5-6.30pm. We’ve been providing this valuable local community resource pro bono expertise on how to “green” their building. In March 2012 we carried out an initial energy audit to see where the building was losing heat and have since been providing all the architectural services for their carbon-reducing “enviro-fit”. The centre, which was built around 1870 as a school, will be getting a new false ceiling (which will insulate the high vaulted-roof) and a storage space will be converted into a new meeting room, with internally insulated walls (see the video here of the new space Cityzen designed). In addition, there will be alterations to the communal areas to improve the safety of the centre and really bring it into the 21st Century! Pooran Desai OBE will be keynote speaker at this Saturday’s meeting. Cityzen will be at the event to answer questions and offer people advice on how to retrofit their own homes to reduce carbon output. There will also be an “Eco Raffle” to raise money for the Hanover Centre with the star prize of… a Cityzen consultation to look at options of how you could improve your home. Finally, it’s the second and last weekend of Eco Open Houses where you can take a look at the six homes we worked on, specifying and detailing their energy saving measures, as part of the Green Deal Pioneer Places project (see our last post on this project). It’s free to visit and a once a year chance to have a look at how some homeowners in the city have made their homes more energy efficient. How can we save energy and running costs?